Yan Feng and Helen H. Kang contributed equally to this work. The online version of this article ( https://doi.org/10.1007/s13238-018-0584-x) contains supplementary material, which is available to authorized users. Macroautophagy (referred to as autophagy herein) is an evolutionarily conserved, lysosomal degradation process by which cells rid themselves of aggregated proteins and damaged organelles (He and Klionsky, 2009). This process involves a finely orchestrated molecular pathway comprising a plethora of ATG proteins essential for autophagosome formation. The mammalian Unc-51-like kinase (ULK) complex plays an essential role to initiate canonical autophagy pathway by relaying upstream nutrient and stress signals to downstream autophagy machinery (Mizushima, 2010; Wong et al., 2013). Normally hyperphosphorylated by mechanistic target of rapamycin (mTOR) and thus inhibited in nutrient-rich conditions, the ULK complex can be activated upon nutrient starvation and subsequent mTOR inactivation (Wong et al., 2013). Moreover, nutrient starvation enhances the activity of protein phosphatase 2A (PP2A) to further dephosphorylate ULK1/2 and trigger a more potent and efficient autophagic response (Wong et al., 2015). However, starvation is not the only trigger for autophagic activity. Other stresses can also induce autophagy in many physiologically relevant settings such as cancer. Interestingly, hypoxia, an oxidative stress associated with solid tumor, ischemia, and many other physilogical and pathological conditions (Brahimi-Horn et al., 2007), could induce autophagy as a survival response (Mazure and Pouyssegur, 2010). Nonetheless, the mechanism by which hypoxia induces autophagy is not well defined. To investigate the molecular mechanism governing the initiation of hypoxia-induced autophagy, we treated wildtype (WT) mouse embryonic fibroblasts (MEFs) with hypoxia (1% O2). The results showed that hypoxia induced robust autophagy within 12 h, as a gradual yet robust increase of microtubule-associated protein 1 light chain 3 (MAP1LC3B/LC3, LC3 herein) conversion, decrease of sequestosome 1 (SQSTM1/P62) as well as increase of autophagosome numbers were observed by western blot and GFP-LC3 puncta (Figs. 1A and S1A). Surprisingly, mTORC1 remained mostly active during early hypoxia-induced autophagy (≤12 h 1% O2), and significant inactivation of mTORC1 did not occur until 24 h of treatment, whereas serum and amino acid-double starvation for 1 h induced complete mTORC1 inactivation (Fig. 1B). Moreover, robust autophagy was still observed in tuberous sclerosis complex 2 KO (Tsc2−/−) MEFs (Fig. S1B), in which mTOR is constitutively active and unresponsive to stress stimuli. In conclusion, mTORC1 inactivation was dispensable for early hypoxia-induced autophagy. Since the mTORC1-ULK1/2 axis is responsible for activating canonical autophagy, we next investigated whether the ULK complex was involved in autophagy induction following acute hypoxia. Remarkably, we found that ULK1 remained hyperphosphorylated and inactive during early hypoxia response (Fig. S2A). Consistently, nutrient starvation but not early hypoxia induced colocalization of ULK1 complex and lipidated LC3 on developing autophagosome membranes (Fig. S2B). More importantly, MEFs and human cancer cells that lack major components of the autophagy initiation complex (ULK1/2, ATG13, or FIP200/RB1CC1) still underwent hypoxia-induced autophagy (Figs. S2C–F and 1C–E), demonstrating a ULK complex-independent mechanism for autophagy induction. However, ULK complex can still play a role in autophagy upon prolonged hypoxia, as long-term hypoxia (≥24 h 1% O2) caused a suppression of mTORC1 activity (Fig. 1B). It is well established that mTORC1 suppression can lead to the activation of the ULK complex and in turn, enhanced autophagy activity. Moreover, we observed that transcripts for Map1lc3b (coding for LC3B), Ulk1, autophagy related 5 (Atg5) as well as autophagy related 7 (Atg7) were upregulated by prolonged hypoxia (Fig. S3A), which prompted us to test the role of the transcriptional factor hypoxia inducible factor 1 (HIF-1α), the master regulator of hypoxic response (Semenza, 2001), in hypoxia-induced autophagy. Under the conditions used in our study, we found that autophagy-related genes were upregulated upon hypoxia in a HIF-1α-dependent manner, as Hif1a knockdown suppressed upregulation of Map1lc3b and Ulk1 (Fig. S3B and S3C). Moreover, Hif1a knockdown significantly attenuated hypoxia-induced autophagy (Fig. S3D and S3E). Lastly, the observation that transcriptional inhibitor actinomycin D mitigated hypoxia-induced autophagy (Fig. S3F) further supports the notion that de novo transcription is important for long-term hypoxia-induced autophagy. Therefore, we suggest a “two-wave” hypothesis for hypoxia-induced autophagy: early hypoxia induces autophagy in the absence of mTOR regulation or ULK engagement; upon prolonged hypoxia, ULK complex is activated due to inactivation of mTORC1, and multiple autophagy genes are upregulated transcriptionally—all these changes contribute to prolonged hypoxia-induced autophagy. We do not know the exact reason why hypoxia increased Ulk1 mRNA level but not protein level (Figs. S2A and S3A). 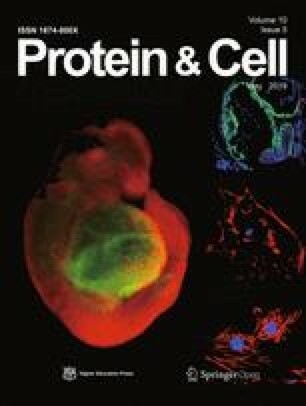 One possibility is that the increased transcription is offset by increased degradation of ULK1 protein, considering that long-term hypoxia will engage ULK1-dependent autophagy, and that ULK1-dependent autophagy is associated with ULK1 degradation as reported previously (Liu et al., 2016). We next examined which molecular players are involved in relaying hypoxic signals to the autophagic machinery. Considering that oxidative stress can lead to an accumulation of mitochondria-derived reactive oxygen species (ROS) (Sena and Chandel, 2012) and ROS can activate adenosine monophosphate-activated protein kinase (AMPK) (Hardie et al., 2012), we tested whether ROS-mediated AMPK activation led to autophagy initiation. Firstly, we confirmed hypoxia-induced activation of AMPK by monitoring an activating phosphorylation site threonine 172 on the catalytic subunit AMPKα and phosphorylation of serine 79 on the canonical AMPK substrate acetyl-CoA carboxylase (ACC) (Fig. 2A). Hypoxia-induced activation of AMPK was also observed in MEFs lacking ULK1/2 or autophagy related 13 (ATG13), notably in the absence of mTOR inactivation (Fig. S4A). Importantly, early hypoxia-induced autophagy was abolished in the AMPKα1/2 KO MEFs (Fig. 2B and 2C). 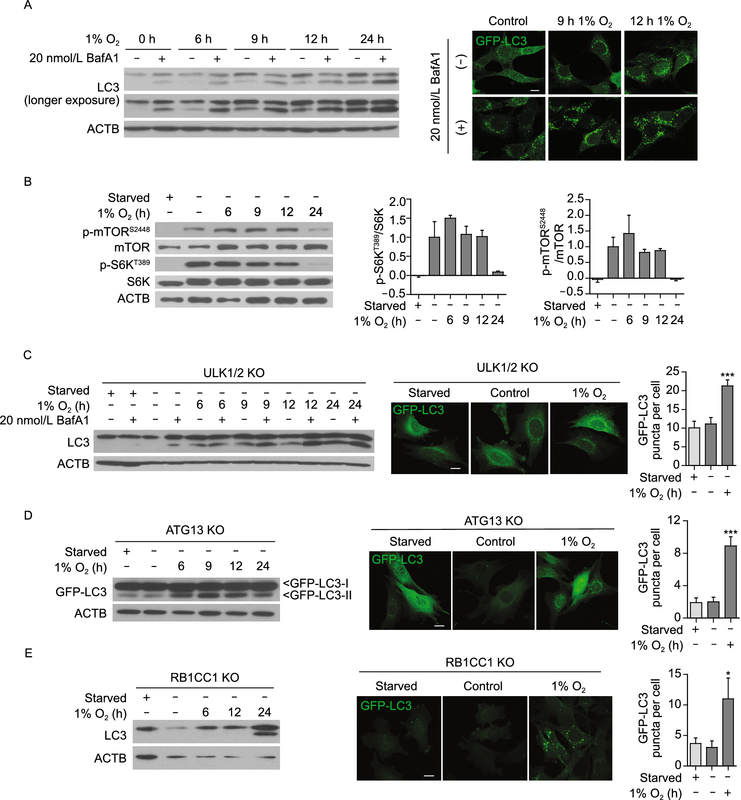 Further, overexpressing a dominant negative K45R mutant form of AMPKα2 in ULK1/2 KO MEFs suppressed AMPK activity and hypoxia-induced autophagy while mTORC1 remained active (Figs. S4B and 2D). Additionally, we found ROS was indeed accumulated in hypoxia-treated WT MEFs (Fig. S4C). Blockage of ROS accumulation by two antioxidants, N-acetyl-L-cysteine (NAC) or 6-hydroxy-2,5,7,8-tetramethylchroman-2-carboxylic acid (Trolox), inhibited both hypoxia-induced autophagy and AMPK activation in WT MEFs (Fig. 2E and 2F). However, ROS accumulation was not significantly affected by the absence of AMPKα1/2 following hypoxia treatment (Fig. S4D), further suggesting that ROS acts upstream of AMPK. Together, these results demonstrate that ROS-mediated AMPK activation plays a crucial role in regulating ULK-independent autophagy triggered by acute hypoxia. In the context of glucose starvation, AMPK directly phosphorylates a phosphoinositide-3-kinase, class 3 (PIK3C3) complex subunit, beclin 1, autophagy related (BECN1), at serine 93 to promote autophagy (Kim et al., 2013). Therefore, we sought to determine whether PIK3C3 complex or BECN1S93 phosphorylation is involved in AMPK-mediated hypoxia. The PIK3C3 inhibitor SAR405 led to decreased LC3 conversion and autophagy flux upon hypoxia in ULK1/2 KO MEFs, despite of AMPK activation (Fig. S4E and S4F), indicating that PIK3C3 mediates autophagy downstream of AMPK. However, unlike glucose starvation, acute hypoxia (≤12 h 1% O2) failed to stimulate BECN1S93 phosphorylation in WT or ULK1/2 KO MEFs (Fig. S5A and S5B). Therefore, upon hypoxia, AMPK may phosphorylate BECN1 at a different site, or act on a different downstream component than BECN1. Interestingly, Mec1/ATR, a DNA repair kinase, has been recently identified as a crucial regulator for glucose starvation-induced autophagy in a Snf1/AMPK dependent manner in yeast (Yi et al., 2017). In mammalian cells, although ataxia telangiectasia and Rad3 related protein (ATR) was activated upon acute hypoxia (Fig. S5C), early hypoxia-induced autophagy was not blocked by Atr knockdown (Fig. S5D). Taken together, our results suggest that glucose deprivation and hypoxia induce autophagy via distinctive mechanisms, although both engaging AMPK. This conclusion is further confirmed by an additive effect on autophagy activation upon combination of hypoxia and glucose deprivation (an ischemia-like condition) in both ULK1/2 KO and RB1 inducible coiled-coil 1 (RB1CC1) KO cell lines (Fig. 2G and 2H). Additionally, consistent with the previous report that hypoxia can induce FUN14 domain containing 1 (FUNDC1)-mediated mitophagy (Liu et al., 2012), we found that early hypoxia induced modest mitophagy under the experimental condition used in our study (Fig. S6A and S6B). However, early hypoxia-induced autophagy was not blocked in FUNDC1-eliminated cells (Fig. S6C). Therefore, hypoxia-induced autophagy targets the degradation of both mitochondria (i.e., mitophagy) and other cargos. In conclusion, we have demonstrated that acute hypoxia can trigger autophagy via a mechanism that is distinctive from that of canonical autophagy. 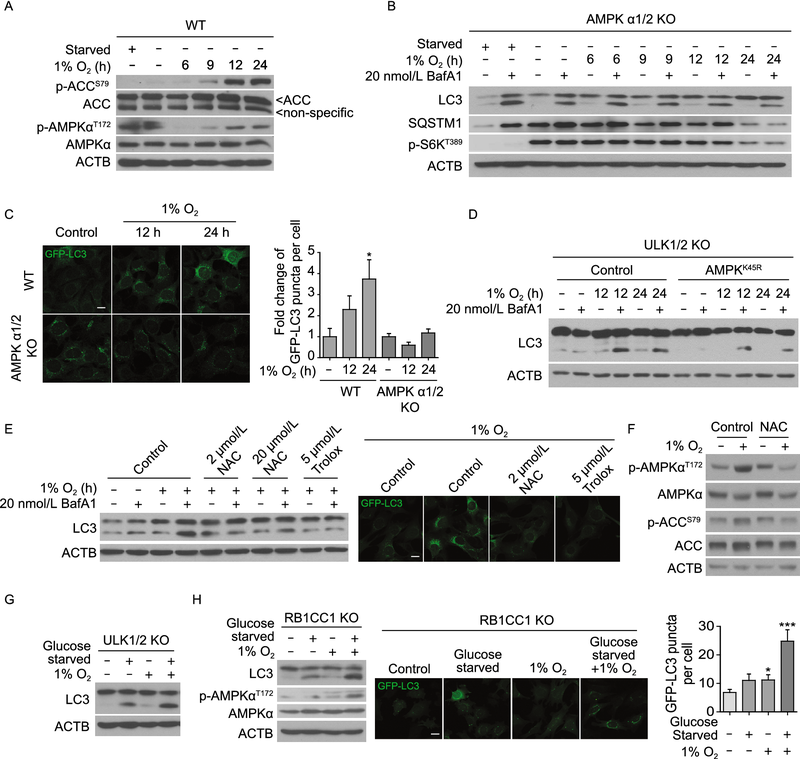 Under this condition, mTORC1 inactivation and subsequent ULK complex activation are not required for autophagy activation; on the other hand, ROS accumulation and AMPK activity play crucial role in acute hypoxia-induced autophagy. Further investigation is needed to define the precise mechanisms of this novel, ULK complex-independent autophagy process. Importantly, this finding also has clear clinical implication. Given its undisputed importance in canonical autophagy induction, ULK has been investigated extensively as a potential therapeutic target. Notably, a novel, highly specific ULK1 kinase and autophagy inhibitor (SBI-0206965) was reported to synergize with nutrient starvation and mTOR inhibition to enhance cancer cell death in vitro (Egan et al., 2015). However, it should be unambiguously determined for each individual clinical condition whether autophagy promotes cancer cell survival and whether cancer cell autophagy is ULK complex-dependent, before a future ULK-targeted treatment is applied to patients. We thank members of the Jiang lab for discussing and reading the manuscript. This work is partially supported by NIH grants R01CA166413 and NIH R01GM113013 (to X. Jiang), a Cycle for Survival fund and a Goodwin Experimental Therapeutic Center fund (to X. Jiang), a NCI Cancer Center core grant P30 CA008748, a grant from National Key Research and Development Program of China 2016YFC0902102 (to P. Wang), and an International Postdoctoral Exchange Fellowship Program 20140049 (to Y. Feng). Yan Feng, Helen H. Kang, Pui-Mun Wong, Minghui Gao, Ping Wang and Xuejun Jiang declare that they have no conflict of interest. This article does not contain any studies with human or animal subjects performed by the any of the authors.